White Sweet Potatoes are a sweet potato that is very popular in the Caribbean and in Latin America — it’s what they think of when they hear “sweet potato.” The potatoes have rough, mottled skin that can be purplish or reddy with creamy-white flesh inside, and are often shaped more like turnips than potatoes. The flesh is not as moist as other sweet potatoes; it is starchier and therefore fluffier. It has a mild taste that some people think reminds them of roasted chestnuts. 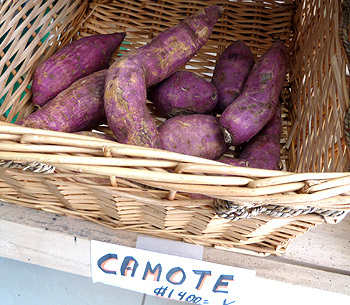 White sweet potatoes aren’t usually cured like most sweet potatoes brought to market are, so they will spoil more quickly. So be extra sure not to buy any that are bruised. Don’t worry if the skin looks patchy; it always does. Like orange sweet potatoes, these belong to the morning glory family, and not to the potato family at all. Like potatoes, if you are going to boil or steam white sweet potatoes, you can remove the skin either before or after cooking. If you peel before cooking, get them into water fast as they discolour very quickly, and keep them covered with water. When you are baking, leave the skin on: it is very nice baked. You can roast, steam, boil, mash or fry white sweet potatoes. In Latin America, they are often used in stews. Many people are very keen on deep-fried chips made from White Sweet Potatoes. Store at room temperature for a day or two; do not refrigerate.